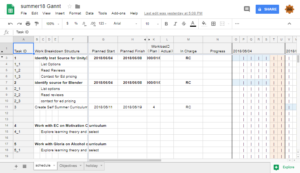 Gannt charts are a terrific organizational tool for project management. Depending on your own perspective, they may appear completely boring or exciting. One of the values of using a Gannt is that it encourages the user to break down tasks into smaller pieces, and consider how long tasks and sub-tasks will take. I have found two Gannt add-ons for Google Sheets, Xinox Gannt and Gannt Chart Generator. While similar in many ways, the primary difference is that Gannt Chart Generator has room for the user to enter predicted workload and actual workload. Both are very useful and have a significant base of users. Gannt charts can be used for any kind of project management, such as game design, software design, instructional design, home construction. They can be used for a single project/task, or used for a set of projects that span the same time period.